The first time I went to Paris, in late August of 1988, I was nineteen years old. I had never expected that I would travel so far. None of it felt real. I visited the Eiffel Tower, Notre Dame, and the Louvre. Then I visited the place I most wanted to see: Jim Morrison’s grave in Père LaChaise cemetery. His music and poetry had helped me through my turbulent high school years. His image had hung on my bedroom wall. I had worn a button with his photo on my black leather jacket. On the vacant building across from my high school, I had spray painted the same words that I had doodled all over my school notebooks: Jim Morrison Lives. I had self-medicated with whatever I could find (which, thankfully, wasn’t much in those days) and had written stream of consciousness poetry while listening to An American Prayer. Scarcely two years had passed since then, and yet a lot had changed in my life. Much of my rage had dissipated, but scars remained. A handful of people were gathered around the grave. Someone had scrawled a poem and left a rose in an empty wine bottle on the battered slab that passed for his tombstone. A young man slouched on the next grave over. He clutched a dog-eared paperback and his face was contorted with angst. I stood for a few moments, my head bowed. Disappointed in myself for feeling numb, for forgetting to bring a flower, at least. I snapped a couple of photos and left, feeling like a thief. In January of 2000, my husband brought me along on his business trip to Paris. I had recently begun to write with the intent of being published. I wanted to visit Jim Morrison’s grave again, even though I’d long since realized that a lot of his poetry was nothing more than random, incoherent scrawlings from his notebooks that his estate had published in order to milk as much money as possible out of his legacy. It had been years since I’d listened to a Doors album. Even so, he was the first person who sparked in me the urge to write. Because of him, I had learned that it was possible to push the boundaries of creativity and revel in strangeness. The battered old tombstone had been replaced, and there was an epitaph written in Greek “ΚΑΤΑ ΤΟΝ ΔΑΙΜΟΝΑ ΕΑΥΤΟΥ”, which means “true to his self”. Despite the bitterly cold day, there were about a dozen people gathered around. I placed my wilted rose on the frozen earth, touched the tombstone, and whispered, “Thank you.” When I looked up, I saw wistful smiles. In March of 2010, I visited Père LaChaise once more. This time it was in search of the Countess de Castiglione, who is the subject of a novel that I’ve been writing off and on for years. After I had found her, I meandered the immense labyrinth until I spotted a small crowd gathered around a metal fence. They all seemed so young, but then I realized that I was their age when I made my first pilgrimage. The tombstone was unchanged, but it could now only be viewed from afar. I reflected on my previous visits and how I had changed since then. I had recently rediscovered the music that had been the soundtrack to my teenage rebellion. I was finally mature enough to understand. The adulation I had felt as a teenager, and the cynicism of my thirties had morphed into simple empathy. He was a human being who had dared to confront his demons while the world looked on, and had ended up being consumed by them. 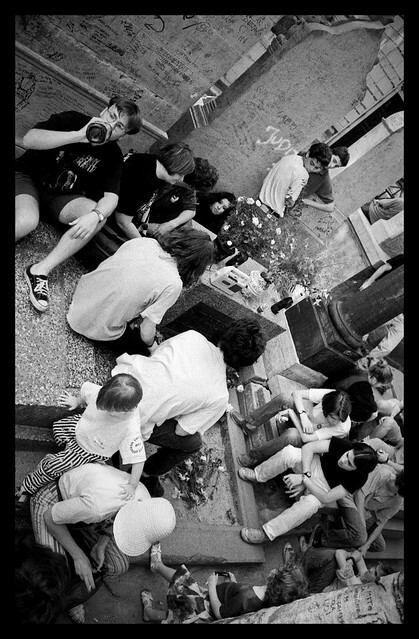 For fans of Jim Morrison and Paris, I highly recommend checking out the superb blog – Paris Mojo. Have you read “No one here gets out alive”? One of the best books I’ve ever read. Of course. 😉 I read it several times when I was in high school. Thanks for taking me there. It was a delightful experience. Wonderful writing, I enjoyed it. You took me back some years! Not too long ago I actually listened to some old recordings of Jim Morrison, Janice Joplin, The Band, CC. Funny you posted this at this time. Thank You! Thank you. Those artists (and others like Pink Floyd, Jimi Hendrix, Crosby Stills & Nash, etc.) are a refuge from the wasteland that modern pop and rock music has become. I couldn’t agree with you more about today’s “wasteland” of music. Today’s mainstream music makers will never know those who paved the way for them. Or should I say laid the Soundtrack? Great post and beautifully written….I’m so impatient I normally don’t get through longer written posts and I don’t even like Jim Morrison that much, (Though I certainly had my own idols (idols is too strong a word, I never liked to think I idolized anyone) just people, musicians, artists, who seemed at that age to be struggling with the same things as me and doing it on a larger stage for all to see. Funny how we grow and yet stay the same. Thank you for having the patience to read this. 🙂 I went through a stage where I didn’t admit to idolizing anyone, but now I’m back to being proud of my innocent adulation. Wow! Great article. Thanks for the mention! Much appreciated. I’m going to reblog this post to share with followers on my blog. Thanks again! Thanks so much for the reblog! I’m honored to be on your fantastic site. Beautifully done. As writers, we grow up to realize that our idols once struggled like we struggle. Kind of similar to when when we realize our parents aren’t perfect-we’re all just people. Thanks for this. Thank you. :) That’s exactly it. where are the hundreds and thousands of cigarettes??? You know, I don’t remember seeing any cigarette butts during my 3 visits. No graffiti, either, except for the poem on the tombstone during the first visit. Gold star for a lovely article – and well-deserving of the Freshly Pressed! The evolution of teenage angst. Loved your photos and words, and congratulations on being “Freshly Pressed.” It truly was a remarkable time for music and personal expression. The end. I really enjoyed this post, I seem to enjoy all of the Freshly Pressed posts! “Stream of Consciousness” poetry was my absolute favorite when I took British Literature. Thanks for the post! They teach “Stream of Consciousness” poetry in British Literature? Must have been fun. Yes actually, my literature instructor (this was just last semester) was a PhD candidate in English and her specialty was in Brit lit after 1900 or something really obscure. She was an extremely difficult grader but taught really well. Very thoughtful self & cultural observation….enjoyable read! A good commentary on how both our own memories and the memories of others change over time. I have visited many cemeteries around the world, both as a tourist and pursuing family history. It is amazing that the simple stones are usually the ones that are remembered and taken care of while the large elaborate tombs have fallen into decay. I’ve noticed that about the simple tombstones as well. Thanks for commenting! I haven’t heard of Jim before. Thanks for making me aware of him! There’s a fascinating book somewhere, as yet unwritten, on the impact early rock stars had on Baby Boomers. Personally, I am persuaded that African American rhythm and blues and rock artists of the 1950s and 1960s did more to engage young whites in civil rights issues than anyone has begun to acknowledge. Once we embraced the music, it was impossible to turn our heads from the culture that isolated, demeaned, and attempted to dehumanize the performers we made part of our lives. Several months ago, I began a blog about Jackie Wilson that is many things: an exploration of the racism of the times in which he lived, a tribute to his achievements against overwhelming odds, an analysis of his artistic legacy, and an expression of my love–sorry, I just cannot find a more accurate word–for this man who deeply affected my life, a man I never met except through his voice and image. Thank you for acknowledging your attachment to Morrison and your respect for how that connection enriched your life. This is just a guess, but I bet there’s much more you could say about that adolescent attachment to Morrison. I hope you do someday. Thanks for sharing your story about your connection to Jackie Wilson. It’s amazing the impact that some artists have on our lives. I wish I could say that I had more profound thoughts on Morrison than what I’ve written here, but I don’t think that I do. Who knows, maybe something else will surface one day. I know. And those who made it through the sixties are starting to pass away. I keep hoping that Stephen Stills and David Gilmour will live forever. I bet it must be difficult finding replacements parts for that record player! Thanks a lot for your comment and for the suggestion about the creative commons license!! Your post just personifies the journey we all go through from our tumultuous teens into adulthood as we realize those that we idolized are just humans like us. It is pretty cool that you were able to go back 3 different times and reflect on how the music related to you at that point in time. Great post! You know how people often say “A picture is worth a thousand words”? Well, these have been worth millions. As a huge Doors fan, I can’t put into words how much this all means to me, this physical connection to Morrison, a hero, be it the last physical connection to him. It’s touching, really. Eighteen years old, and wishing I was Fifty, just so I could have experienced his music at his prime. Shame really, the state of auditory art these days. I miss him, even though I never really knew him. You could practically sense the shell he was put in, and how it has taught me to always break out and differ. So, thanks, for reminding me of him, for sharing these. I wish I could make it to Paris, just to marvel at a legend resting. Thanks so much. Really. Thank you so much for this comment, which brought back even stronger memories of how I used to feel. Jim was from my parents’ generation, so I used to wish I was older just to have “been there”. I really thought it was great seeing all those teenagers at his grave the last time I was there. The crowds who visit his grave seem to be getting bigger, although this is not necessarily a good thing. One day hopefully you can visit! I really do hope to be there, and hopefully, I will. If you can’t be a legend yourself, might as well respect them. I’m glad age and time hasn’t deterred any of his music though, that shows what a timeless person he was and what an epic band they were. What an enjoyable read–it was interesting to see how the grave has changed through the years. I was just at Pere LaChaise in April, and seeing Jim’s grave was one of the most memorable moments of the trip. I’m really not a huge fan, but I’ll never forget the feeling I had standing there. It was our last day in Paris and for the first time, we were surrounded by friendly people (mostly American, like us) making conversation. One American couple we’d given directions to earlier chatted with us about Jim for a long time. They’d brought along a bottle of something (I didn’t see what) so that they could have a drink with him. I could tell from our conversation and the look in their eyes that being there meant so much to them. It was easily the most beautiful moment we had in Paris, and hearing your beautiful story reminded me of it. Thank you for your post, congrats on being Freshly Pressed, and good luck with your writing! Nicely expressed post. I am a huge Doors and Morrison fan (and a poetry freak). Ive read many books on the band and Sir Douglas Morrison. If you havent read Ray Manzarek’s bio or Steven Davis’s work on Jim, I recommend it. Danny Sugarman (who cowrote “No One Here Gets Out Alive”) also added onto his own personal story of being the Doors manager post Jim’s death in his crazy book “Wonderland Avenue”. Your post inspires me to write a piece on my discoveries of Morrison’s old haunts in Los Angeles like Venice Beach bars, hotels, and places of inspiration. Its fascinating how the music and experiences of others weaves into our own hearts and lives. Thank you for sharing. I have only read No One Here Gets Out Alive and Patricia Kennealy’s book, which a friend lent me. I’ll check out those other books. A post about his LA haunts would be awesome! When I moved to LA at age 18, I wanted to live in Venice Beach because he used to live there. And there was that bar in West LA where he used to hang out, I forgot the name. I used to drive by it all the time. I remember seeing Chopin’s beautiful tombstone. There are many, many inspiring people resting in Père LaChaise. I recall a late 1960’s solo road trip from Tennessee to Wisconsin. Around 1 a.m. as I passed by exits for East Chicago Indiana, a long recording of the Doors “Light my Fire” came on the radio. That recording kept me company until the I-90 exit for Elgin, far on the north side of Chicago. I haven’t heard that long recording since, but remember that it seemed magical. In December of 2012, I stayed at a hotel across the street from Père La Chaise. In a rainy December Paris, that graveyard also held its magic. It’s good road trip music, for sure. When I arrived in LA at age 18 after having driven there alone from Michigan, “LA Woman” came on the radio. I took it as a good omen. I agree that Père LaChaise is more magical in the gloom than in sunlight. Thanks for sharing your memories! This entry ends with a clap of thunder– Why did you not linger? Fear? I must know. love the way you trace the teenage adulation to the mid-life cynicism to the human-to-human reckoning, finding the mortality and humanity beneath the immortality and the legend. I think I’m going to subscribe now. Hi there – I did not linger, not out of fear, but more like I’d learned what I needed to learn about his impact on my life and it was time to let go and leave the space for the young people who, hopefully, would come to a similar conclusion one day. I am an ancient fan of Jim Morrison, well ancient to most, I was his comtemporary and still love him. Nice to hear that you’re still a fan. The music is timeless. Well written I enjoyed this piece. The fact that such an american character is buried in France is very like Jim. Can you imagine if he was buried in LA? I wonder if there would be as many visitors. Hopefully, your teenagers will identify with something interesting and inspiring. Loved your story! Pere Lachaise is such a magical place that I’ve enjoyed visiting over the years, including this summer. I also visited Jim Morrison’s grave three times (http://www.flickr.com/photos/bella3/4557450337/in/set-72157623819120507/) and was amazed by the transformation that took place. You’ve captured it well in your photos. Oh wow, you’ve got a photo with the bust! It’s sad that people felt the need to deface all of the graves around his and steal the bust. And people might wonder why there’s a fence around it now. Great post! It was interesting how you paired the different trips to his grave to where you were in your own life. When I visited in 2003, it was an odd experience to say the least. It’s very strange to visit a gravesite and be surrounded by people and watched by a guard. It all felt a bit bizarre fortunately, it was in November so it was quite quiet. However, I found the entire cemetary to be really incredible. I could definitely go back and wander all over again. Yeah, it’s not a private moment when you visit. I’ve never seen a guard there. I hear that there are now two hidden cameras. Cool pix. I’ve still not seen Morrison’s grave, though last time I was in Paris, some people behind me announced their intention to go. His music, of course, was iconic. Manzarek’s Vox Continental defined their sound and I can’t think of the 1960s without thinking of at least one Doors track. Hopefully you will make it to the grave one day. Even if you’re not a huge fan, it’s an interesting experience. Thank you! Hope you make it to Père LaChaise. It’s a beautiful place to spend a few hours. What a lovely post. I love that you visited the grave several times in your life and were able to voice out the differences in your feelings. Btw.. I m a big fan of Jim Morrison. Your post has urged me to go visit his tombstone even more now !!! Thank you! I hope you get to visit it one day. This is not quite of my generation, even so I read through it all and have been touched. Hi Harry – Thanks for reading. There was a real throng around Jim’s grave, but the atmosphere was relaxed and respectful. We were all just visiting our sleeping hero, I suppose, and voices were lowered to reflect that feeling. I would’ve been about 19 at the time and was just discovering The Doors. Hi Sketch – Wow, what an awesome photo. It captures the atmosphere. Thanks for sharing it! Thought it might be of interest, since your story so closely reflected my memories, as encapsulated in that picture. If/when I ever get round to sorting the rest out into some kind of series, I’ll let you know (20 yr backlog, lol). It’s changed quite significantly in the intervening years, so it might be worth showing those who care about such things what it was once briefly like, more broadly and in detail. Again, thank you for the appreciation, and know its returned; I found this post very moving. Yes, please do let me know if you ever upload those other photos. I’d love to see them and I’m sure that others would, too. Glad you got something out of my post. Cheers! Reblogged this on Stephaniejane's Blog. Beautiful post. I’m American and have only been to Paris once — in the 90’s. I visited Père LaChaise and saw Jim Morrison’s grave. I was really there to visit Chopin’s grave, though, and like you I kicked myself for not bringing flowers. My husband had thought it was silly to purchase flowers for a man who had lived and died in a different century. But when I got to the grave it was adorned with flowers and I wished I’d added mine. Instead, I left nothing but took pictures. Chopin was important to me, to many. Paying my respects was important as well. Loved the post. Thanks so much for your comment. Offerings of flowers, etc are probably more for the living, and ourselves, than for the departed, but even so it doesn’t feel good to come empty handed. Chopin’s grave is beautiful. Thanks for the delightful story. I enjoy how you tie your memories to this one place at different stages in time. You are lucky to have had the Doors to fill your angsty teen years, as opposed to some of the stuff I had in the mid-2000s. Oh yeah, I can’t imagine trying to drown my angst in today’s music, or in anything post grunge. It’s good to see that kids are still looking to classic rock to fill the void. What would be cool is a time-lapse video of his headstone from the day it was placed until today. Just a snapshot a day. I’m sure the transformation would be fascinating. If I ever visit France, it’s on my list of things to see. That’s an interesting idea. It would be a challenge, though, because most of the photos would be from the pre-digital era. Thank you for sharing the changes not only of the gravestone but of how you processed your experiences of visiting the grave. Reblogged this on Where the Mind Roams. This post is well-written and I enjoyed reading every part of it. I’m glad I’ve stumbled upon this blog of yours. Speaking of the rest of your blog, is your blog title a reference to the Pink Floyd song, “Wish You Were Here”? Actually, the title is partly a reference to that song, which is my favorite of all time. But there’s another reason why I’ve referenced it and connected it to my writing. I won’t go into it here, but the connection will become clearer as I post more. Enjoyable read.. I’m not really that much of a fan (I have a different influence), but this got me curious.. I’m going to check more of his stuffs.. Thanks for sharing! Thank you for taking the time to read it, even though you’re not such a big fan. I like this because I have visited and re-visited Jim Morrison’s grave, too, and felt differently with my passing years. It was much more crowded last year than it was the first time I went in 1998. The gatherers seemed so young. What were thewy doing there? I wondered. He was from my generation, not theirs. That’s what I noticed too. I felt old! I think that certain young people will always develop a fascination with music from the psychedelic 60s/70s. Your wonderful post sent me scurrying for my photo albums – I couldn’t remember which gravestone was there when I made my first pilgrimage in 1997 (it was the second version). I really connected with your ideas about the passage of time – I was in my 30s when I first went there – and how The Doors’ music, his poetry and his chaotic life influenced me differently at different stages of my life. Thank you for sharing your reflections. Thank you for your comment. It’s so cool to hear that others feel a connection with this little memoir. Thank you for this post, it’s wonderful (and your writing, beautiful!). I was much the same in high school; Morrison’s music (and Janis Joplin’s, and Hendrix’s – the 27 club!) really connected with me and the state I was in then. I didn’t make it to Morrison’s grave when I visited Paris, but your visits document a really interesting change not just in yourself but how peoples’ relationship with these spaces have changed over time (I remember reading Wilde’s grave was covered in lipstick marks, and now there is glass or plastic over it or something?). Thank you for the compliments! Is Oscar Wilde buried in Père LaChaise? I am embarrassed that I don’t know. Next time I’m in Paris I’m going to spend hours visiting all of the great artists who rest there. Other than Jim’s, I’ve only seen the graves of Chopin (by chance) and the Countess de Castiglione (which was an unforgettable experience as well, but in a very different way). Thank you. Good to hear that he inspired your path in life, in a positive way. And welcome to WordPress!